The beautiful and wild Trinity Alps Wilderness area of northern California is formerly known as the Salmon-Trinity Alps Primitive Area. This area is home to wild rivers, virgin stands of timber, crystal clear lakes and stunning high peeks. Two of the best know rivers are the Trinity River in the south and the Salmon River in the north, while these are the two main rivers there are lots of other rivers that feed into the numerous lakes in the area. The area is located about 50 miles north of Redding and about 210 miles north of Sacramento, California. The closest town is Weaverville, where you'll also find the ranger station. If you visit the Trinity Alps Wilderness in summer you will find many meadows with many wildflowers and butterflies. You will see black bears, blacktailed deer, coyote, bobcats and mountain lions. There are over 500 miles of trails for backpacking, some for the beginning hiker and many for the experienced hiker. Lots of camp sites are available with most of the area infrequently visited, making it the perfect place to find solitude. Make sure you plan for changing weather, as it can be warm in the afternoons and with thunderstorms in the evenings. The area offers many types of recreation from backpacking, camping, fishing, hunting and rock climbing. Lakes are full of trout and the Trinity River has steelhead and Chinook salmon that migrate to the area to spawn. You can enjoy hikes through some of the most impressive forest with cedar, douglas fir and ponderosa pine, as well as white fir, western white pine, and knobcone pine. Gold panning is also possible in the area. 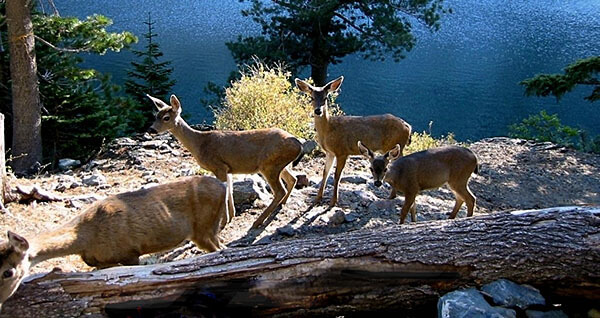 If you are planning to come to the Trinity Alps for a visit make sure you get a wilderness permit, camping in the area is usually limited to 14 days. Use the leave no trace seven principles when visiting any wilderness area. Close to Weaverville in north California. The ranger station can be found at Weaverville, CA 96093. The wilderness is accessible year round. Last updated by jack on 16 March, 2014 in Destinations. Link to Flickr added, as you didn't leave your own URL. Hello -- the above photo belongs to me. It's marked Creative Commons and you are welcome to use it but a link back (to my site) is required which seems to be missing -- though you did credit me for the photo. Thanks.